Patricia Meservey will step down as Salem State’s president later this year. Last year, a search committee at Springfield Technical Community College recommended four highly qualified administrators as finalists for the job of president. Three of them were women, but the Board of Trustees ultimately picked the only male candidate to lead the institution. None of those involved in the selection process has suggested that sexism affected the outcome. But the decision fit a pattern among colleges and universities in Massachusetts and nationwide: Despite often being named as finalists, women are rarely chosen to serve as presidents. Just 35 percent of the 80 private colleges and universities in Massachusetts have female presidents, according to the Eos Foundation, a philanthropic organization. In the state’s public higher education system, the numbers are even lower: Just 31 percent of the 29 institutions have women leaders. That figure could dip even lower, to 24 percent, when Patricia Meservey steps down later this year as president of Salem State University. 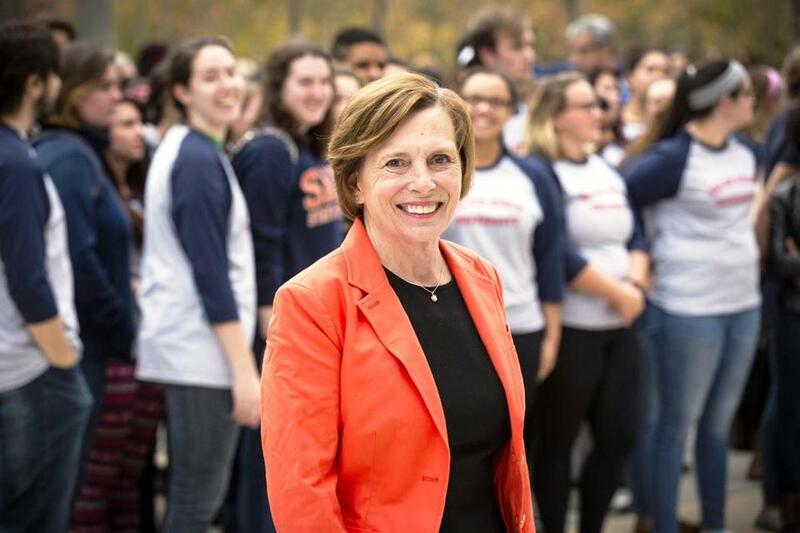 She is currently the only woman serving as president of one of the nine state colleges in Massachusetts, and Salem State has not named her successor. Women in higher education say the gender disparity is not a surprise, given the leadership of the boards of trustees that select presidents. Only five women currently serve as chairs of the 25 boards that govern the public higher education system in Massachusetts. “We need to change up the diversity on boards to change up the diversity in leadership,” said Laura Douglas, who was selected in December as president of Bristol Community College in Fall River after being named a finalist to lead Springfield Technical Community College and Holyoke Community College. Data from the American Council on Education indicate there are more than enough qualified women to fill available leadership positions nationwide. For example, women have earned more than half of all doctoral degrees since 2006. Yet women made up just 26 percent of all college presidents nationwide in 2011, up slightly from 23 percent in 2006. Still, academia is ahead of the corporate world, where just 6 percent of the chief executives on the S&P 500 list, and 4 percent on the Fortune 500 list, are women. On college campuses, as in business, one potential factor could be the personal pressures and sacrifices women make to climb the leadership ranks. Female college presidents are less likely than men to be married and have children, the council said. Some qualified women may not apply for top jobs because of family responsibilities. Others with children may face doubts about their ability to devote themselves fully to serving as president, said Judith S. White, president and executive director of Higher Education Resource Services, an organization that promotes women’s advancement in academia. Women leaders in academia say their underrepresentation has practical consequences. Male faculty members hold a higher percentage of tenured positions. And men earn more than women, by an average of $13,600 at public colleges and $17,800 at private ones. There are also symbolic implications, Meservey said. “Our young women who are attending colleges need role models, and we also need the voice of women to bring a diversity of views” when colleges make hiring and policy decisions, she said. Sherry Penney, chancellor of the University of Massachusetts Boston from 1988 to 2000, said she tells women it’s not enough for them to have stellar academic credentials to prepare for roles as college presidents. They also need experience in managing budgets and raising money, and they must cultivate an interest in sports, she said, because of the vital role that athletics play in the culture and fund-raising at many colleges. Andrea Silbert, president of the Eos Foundation, which seeks to promote women leaders, noted that, just among Massachusetts’ state and community colleges, there were 10 female presidents in 2007. Today, there are eight. Underscoring just how difficult it is to permanently change the landscape for women in higher education, Margaret McKenna, a former president of Lesley University and Suffolk University, said colleges that have had women presidents may actually be reluctant to hire another.